The school season has already begun here in India, and it’s about to start in the USA and other countries soon. Packing kids lunch is always a challenging task. I shared a few kiddo’s favorite lunch box recipes last year, and here I am back with another set of kids friendly lunch box recipes. 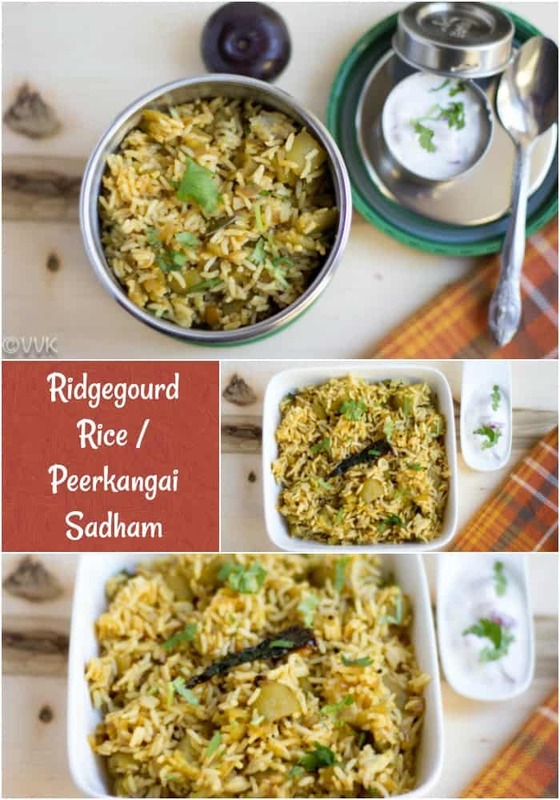 The first recipe that I am going to share is the Peerkangai Sadam/Ridgegourd rice. It’s a mild yet delicious rice with the veggie sneaked in. 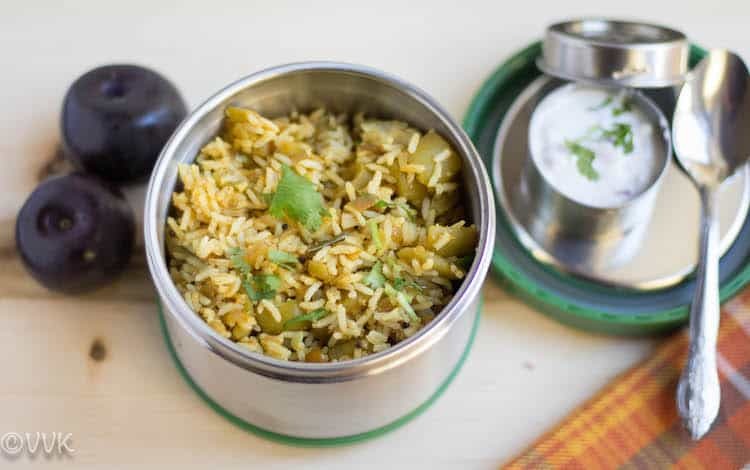 This week’s blogging marathon theme is “Kid’s friendly lunch box dishes, ” and as I mentioned above, I am going to share the ridgegourd rice recipe today. 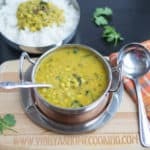 For these vegetable-based rice dishes, I always use vaangi baath and garam masala powder combination. 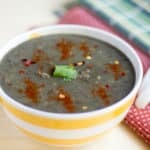 It provides the required spice and flavor and makes it delectable. 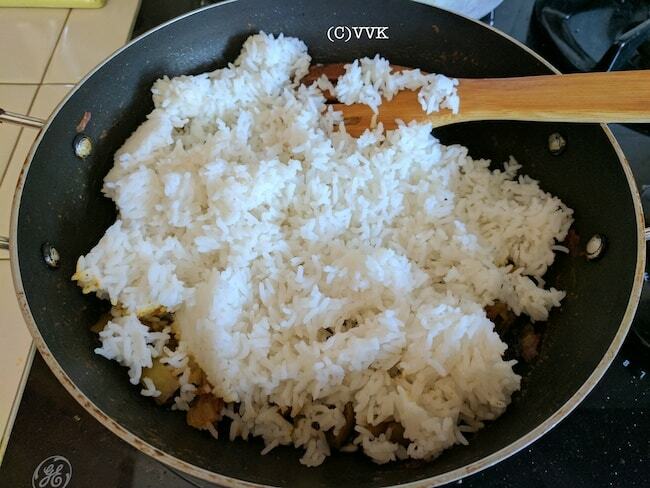 All you need to do is, do the tempering, cook the veggies with spice powder and finally add the rice and mix. That’s it. You can replace ridgegourd with your favorite vegetable. I usually prefer vegetables, that gets cooked quickly like Zucchini, Chayote Squash, Spinach, Snake gourd, Peas, etc. 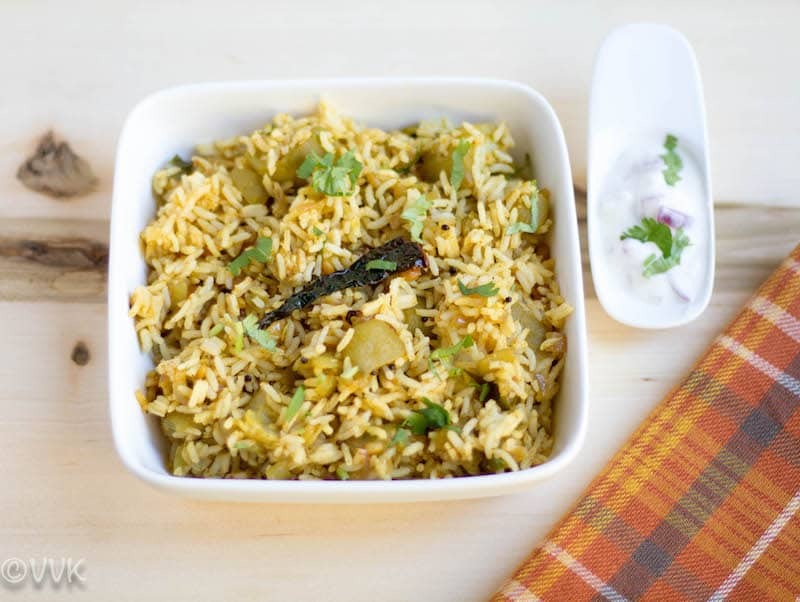 Once you have the veggies chopped and rice cooked, you can prepare this recipe in no time. If you have leftover rice, that works well for this recipe as well. Wash and peel the ridgegourd and cut them into small pieces. Cook the rice in your preferred way and set aside 3 cups and let it cool. Break the dried red chilies and set aside. 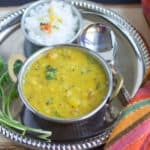 In a kadai heat the oil and add once the oil is hot, add the mustard seeds, urad dal, and channa dal. 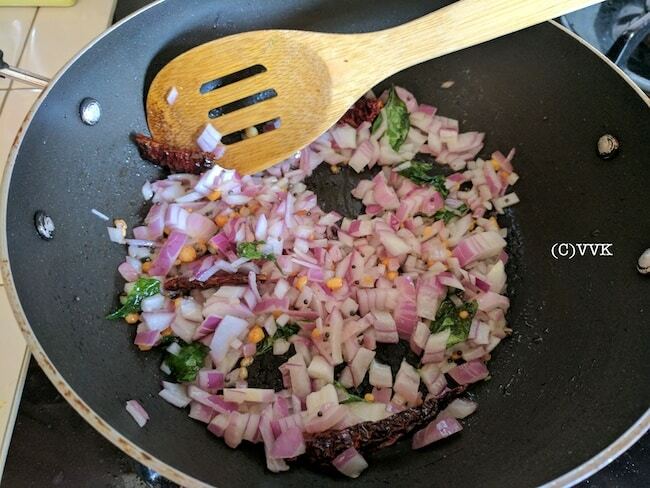 As they start to splutter, add the broken red chilies, hing, and the curry leaves. Let it cook for a minute. At this stage, add the chopped onion and cook until translucent. 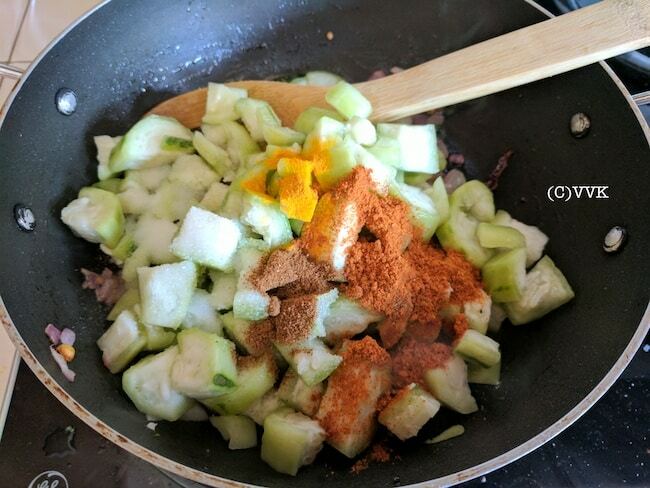 Then add the chopped ridgegourd, turmeric powder, vaangi baath powder, garam masala, and salt. Mix it well and cover and cook for 3 to 4 minutes. Do not add any water as ridgegourd oozes out water. After 4 minutes remove the lid. Let it cook until all the water evaporates and remove it from the heat. Finally, add the chopped cilantro and serve hot with raita. You can replace ridgegourd with your favorite vegetable. Instead of oil, you can do the tempering with ghee. But as I pack it for lunch, I go with oil. 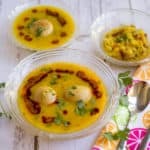 You can also add a dollop of ghee when you serve. When you are using water rich veggies, do not add any water while cooking. 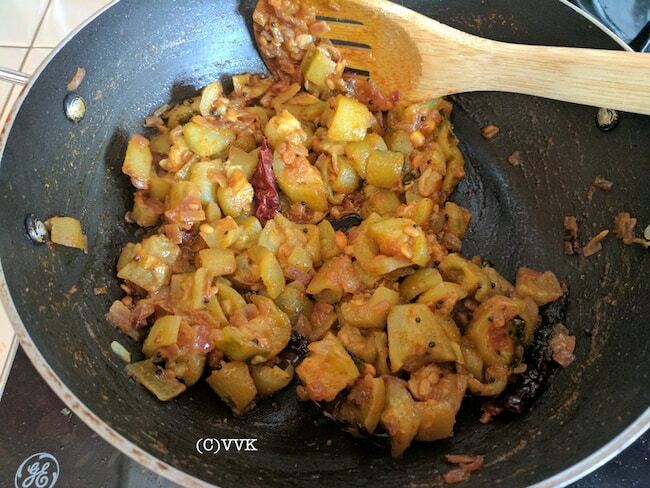 If you are using veggies like brinjal or okra, sprinkle some water. Also sending this to Srivalli’s Kid’s Delight event, guest hosted by Priya Srinivasan, themed on Kids Lunch Box Recipes. 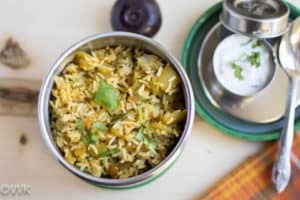 A simple kids friendly delicious lunch box rice recipe with ridgegourd sneaked in. When you are using water-rich veggies, do not add any water while cooking. 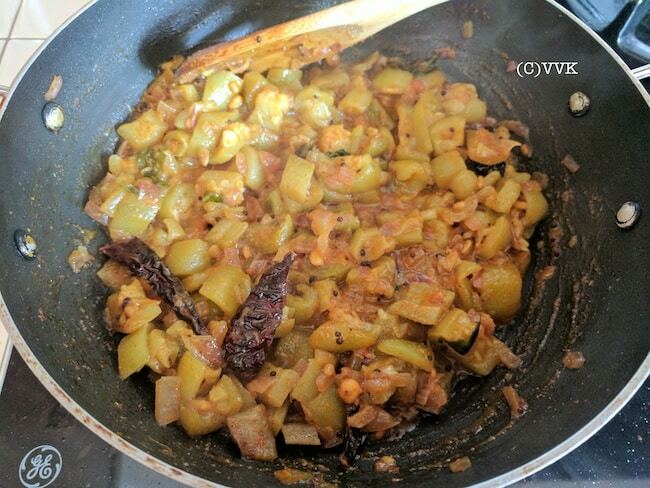 If you are using veggies like brinjal or okra, sprinkle some water. 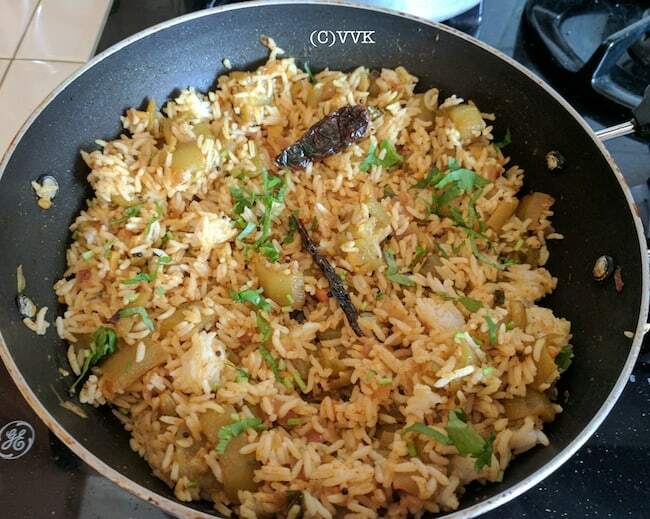 when i saw the entry for kids delight i was delighted srividhya, i have made thogayal, kootu, dal with ridgegourd but never imagined a rice. i m definitely try this!!! Pictures are so clean and crisp!thanks for sending it across to kids delight! I only tried this veg once and was not a fan but this is tempting me to maybe try it again! Please do try Mir. I know its a hit or miss veggie. I too like such quick fix rice varities for the lunch box. Will keep this in mind. 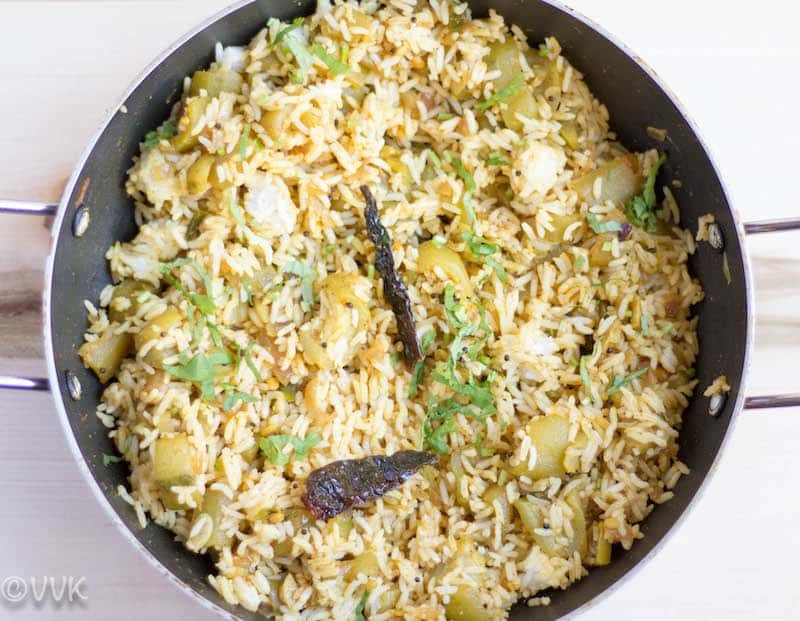 My girls are picky eaters when it comes to vegetables.But I am going to try this rice dish for me. Looks yummy. 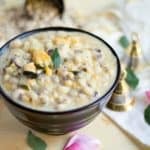 I usually add ridge gourd to khichdi. Also like the idea of adding it to rice with vangi bhat masala. I usually add all the veggies in rice. But a great idea to add in kichadi as well. yes, ridge gourd is one hit or miss vegetable. Thanks Jyoti. wow!! 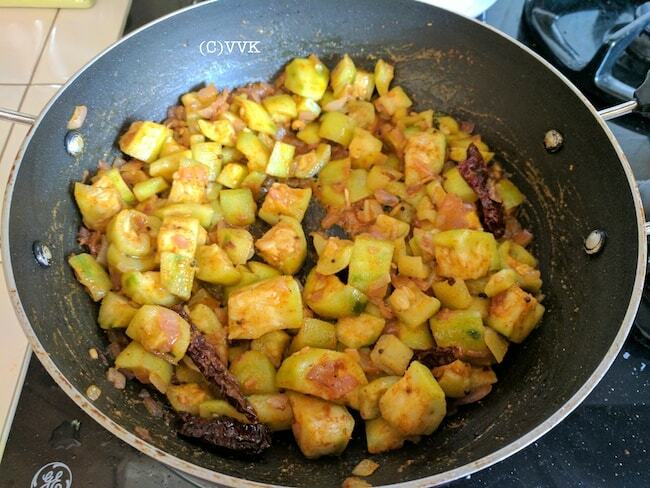 Sometime back I had seen a similar recipe with tindora / ivy gourd. Interesting!! Its really wonderful that your son eats this rice, will have to try for my daughter! Anything with bit of vaangi baath powder, he likes it. So I try sneak in bit of vegetables here and there.